Having low porosity hair can be challenging for those who also struggle with retaining moisture. Hair with low porosity has cuticles that are very compact, making it difficult for water and other hair products to penetrate the strand and provide the optimum amount of moisture. You may have low porosity hair if you’ve noticed that water tends to bead up on your strands or if you experience dryness no matter what you do! Product buildup on your hair will create an even greater barrier for moisture absorption. Use a clarifying shampoo to help remove the extra gunk from your strands and prepare the outer layers of your tresses to absorb and retain maximum moisture. Heavy oils don’t moisturize hair strands very well (especially if they are low-porosity) simply because the molecules are just too large to actually penetrate the hair shaft. Using lighter oils are much more effective in providing a real moisture boost. Regular deep conditioning treatments are a must for maintaining the moisture levels in your hair. Whether you choose to add heat to your treatments, or opt for a DIY deep-conditioning solution, you can rest assured that this essential habit is key to a healthy, moisturized mane. If it’s not a part of your current regimen, add it in ASAP! 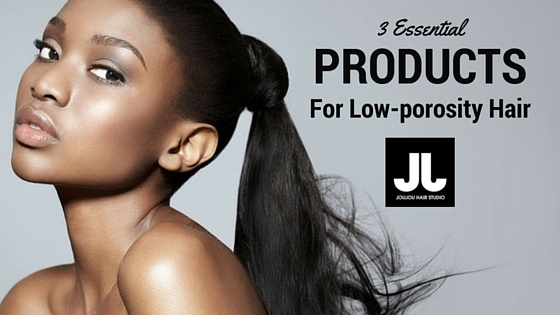 Low porosity hair has a tougher time retaining moisture simply because of how it’s naturally structured. All this means is that if you have low-porosity hair, you have to up your moisture game to reap the maximum benefits from your hair regimen. The most important thing to remember is to love the hair that’s on your head and treat it well! Here’s to healthy, happy, moisturized hair! Did you try out our suggestions? Tell us how these products worked for your low-porosity hair in the comment section below! At JouJou Hair Studio, we often tell our clients about the benefits that come with using hair steamers. The reason why these handy salon contraptions are so great is because they open up the hair follicles, which allows each strand to receive all the benefits of deep conditioning treatments. However, not everybody can make it to the salon for treatments on a weekly basis. The good news is, there is a DIY solution that can get you the same results without having to step foot outside your home (unless, of course, you want to). Put on a processing cap (a shower cap or even a plastic bag will work in a pinch). Ensure the processing cap covers your entire head tightly (tie a knot to tighten if necessary). Grab an absorbent towel from your linen closet, or a turban towel. Soak the towel or turban towel in water. Place towel of choice in microwave for 2 minutes or until very warm. Wring loosely and wrap towel/turban towel around your head. Cover your towel wrapped head with a plastic bag large enough to fit over your entire head. Sit under hooded or bonnet dryer for 30 minutes to 2 hours (or you can let your own body heat do the work). Following your treatment, be sure to rinse your hair with the coolest water you can stand. This seals hair cuticles and locks in all the goodness that your steaming treatment has infused into your hair. Adding some steam to your deep conditioning routine is a great way to lock in moisture and give your hair a strength-boosting treat! Give it a try on your next wash day. 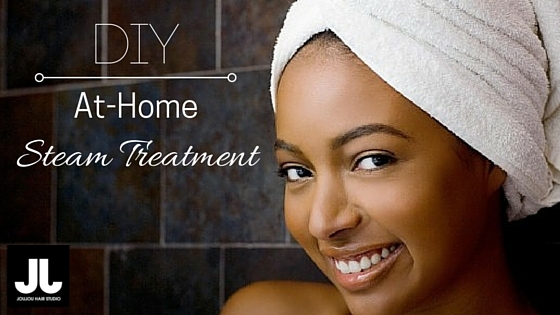 Did you try this home steam-treatment method? Let us know how it went by commenting below! Need more tips or personalized hair advice? Call 416-255-4247 to book a FREE consultation! 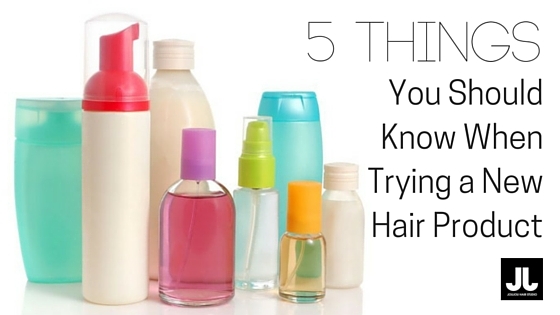 With so many hair products on the market, it can be overwhelming trying to figure out what works best with your hair. You might even be tempted to buy the latest thing every week and become a “product junky”! Well, have no fear! The hair experts at JouJou offer their best advice for trying something new. Focus on these five things the next time you’re in the hair care aisle and you’ll be well on your way to finding your mane’s best match! The first ingredient is the most important, because that is what makes up the majority of what the product. – Is the product made of mainly natural ingredients? Reading the instructions is extremely important. Using the product in the right way will determine how well it will work (not to mention you’ll avoid damaging your hair from improper product use). Also– Google is your best friend! Read plenty of reviews on the product and don’t forget to consult professionals in the industry. Rome was not built in a day! Use the product consistently for at least 3 months before coming to any conclusions (unless you have a bad reaction, in which case it’s best to discontinue immediately). 4. Whats Happening to Your Hair? You can’t reach a final verdict on a product unless you know the effect it’s actually had on your hair. And you won’t know unless you deliberately keep track. Try keeping a simple journal to track any changes you’ve noticed in your hair since beginning to use the product. Does your hair like your new shampoo/deep conditioner/leave-in or not? How does your hair feel? Good or bad? What has changed? What’s the same? Write it down and refer to it at the end of your trial period. If you’re trying a new shampoo, don’t mix with another shampoo. The same goes for conditioners, oils, leave-in’s….etc! If you don’t use one product at a time, it will be difficult to know which product is making the difference. Sounds simple, but these five important points are often overlooked when deciding to try a new product. Here’s to safe and educated hair experimentation! Don’t forget– JouJou cares about your hair! CALL 416.255.4247 (HAIR) today to book your complimentary consultation :). Have you tried out a new product recently? Tell us about your experience in the comment section below!